James Ivory is coming to the Hollywood Theatre on Oct. 10 at 7:00 PM to introduce MAURICE, the winner of the Silver Lion at the 1987 Venice Film Festival. Oregon’s most distinguished filmmaker is famous for his participation in the longest and most productive collaboration in film history, Merchant Ivory Productions. He grew up in Klamath Falls, and graduated from UO in 1951. Oregon Movies, A-Z is offering discounted tickets to the PNW Media Research Consortium. 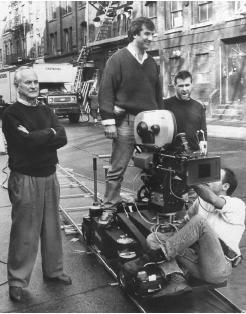 The commercial success of James Ivory’s films obscures his status as an independent filmmaker. He is completely independent. He owns his films, and has had final cut on all of them. As an independent working with limited budgets, he frequently cast unknown actors. Helena Bonham Carter, Hugh Grant, Rupert Graves and Daniel Day Lewis all received their first starring roles from James Ivory. James Ivory will also introduce AUTOBIOGRAPHY OF A PRINCESS on Oct. 11 at 11:00 AM at the Hollywood Theatre and will attend the 1:00 PM screening on Oct. 11 of James Blue’s THE OLIVE TREES OF JUSTICE, winner of the Critics Prize at Cannes in 1962 Blue became Oregon’s first Oscar nominee in 1969. James Ivory and James Blue were classmates at the University of Oregon, where they met building sets for a student play. Both would go on to make major contributions to the emergence of independent filmmaking as a viable alternative to Hollywood studio system. The PNW Media Research Consortium’s discount code is MCOG. To receive the discount, enter the code MCOG when purchasing tickets online at hollywoodtheatre.org. Anne Richardson grew up in Portland, Oregon. She went to school on the East Coast, and remained there, homesick but happy, for almost 30 years. Now returned to Portland, she explores the intersection of Oregon history and Oregon film history as the director of Oregon Cartoon Institute and creator of the film blog, Oregon Movies, A to Z.